On the Gold Coast there is a store called FOUND. If you are familiar with it you will know that this store does an excellent job of 1) sourcing original good quality and design pieces for cheap 2) reupholstering these pieces to create new furniture 3) selling it at a premium to people who do not have the time or inclination to search for such pieces. It is a simple concept done the world over but these guys stick out as someone who is doing a really good job. They generally have mid century design pieces and update them with contemporary fabric. I love it and I am yet to find its match in Sydney although I would love readers in the know to let me know?? Vampt has all the mid century pieces you could ask for and yet there is something fresh about FOUND. I put it down to the fact they seem to dismiss the need to maintain the integrity of the design and are happy to commit design and restoration sins such as painting wood or using modern fabric. It may not help the pieces hold value but they look hot! Um- arhh! 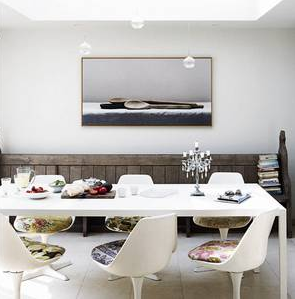 So, whilst we are on the topic of mid-century design classics I urge you to pick up these chairs if ever found at garage sales or ops shops- The Tulip chair was designed by Eero Saarinen in 1955 (read more here) and works wonderfully on its own or updated with a fresh printed cushion. No sins required. Given the smooth clean “modern lines” of this piece (it was considered space age in the 50’s so you can imagine why Star Trek actually popularized the design) this chair works well both round and angular table shapes. Work with different fabrics to create a pop of colour- the top image has different prints which looks great or pick one print that you love. I wouldn’t colour block with upholstery unless you are after that Austin Powers vibe – if it is not all white I think the cushion needs a bit of a print to make it look fresh. Don’t forget you can use the complimenting table (see middle image) if you want a compact and authentic setting. As these are not likely to be a cheap investment (chances of garage sale finds are slim to none) you could use these as a row along one side balanced out with a different chair opposite. I wouldn’t use these as alternating chairs- keep them lined up and together where possible. Finally I would like to draw your attention to the incredible use of colours in the last image. 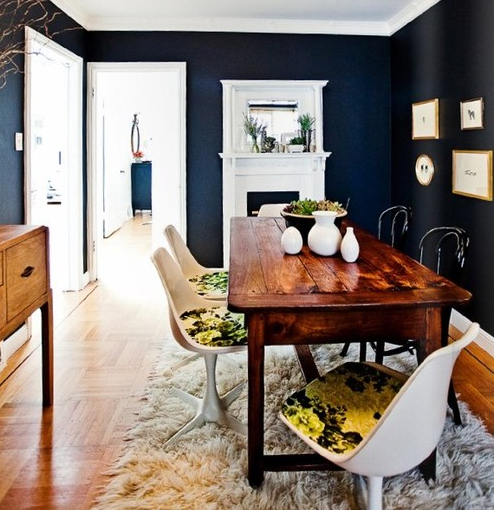 One of the great elements of this room is the dark walls that allow the silhouette of the chair to really pop. Even if you have just two of these chairs and want to create an impact I would place them against a back drop of a strong bold block colour and allow the design excellence to speak for itself.